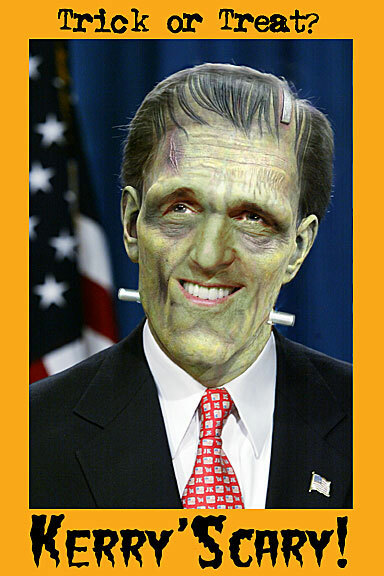 Scary Democrats: a Horror on the Way? Hat tip to Michelle Malkin for the photo. Ok, sKerry is an easy target. Even without the Photoshop make-over, he tends to look like a haunted tree. But scarier still, are his comments lately about the people serving in our armed forces. He can claim he meant something else, but I fear he said what many prominent Democrats really believe. France has had an ongoing slow riot since the riots that began last year at this time. During this past year, over 100 cars PER DAY are burned, and an average of 15 attacks per day occur on police and emergency services. 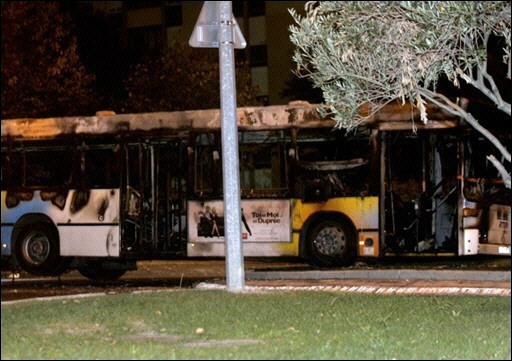 Now attacks have begun on buses, with 3 buses burned around Paris, and one recently in Marseille, has left a 26 year old French woman badly burned and near death. There have been "controls" put on Media reporting, in the hopes that the lack of coverage would discourage more violence. It seemed to work for a while, but now the violence is escalating again, regardless of the coverage or lack therof. With photos, and a video link. Has links and updates to include more buses, and a map. 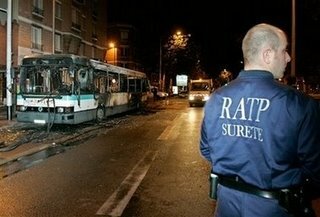 About the bus attack in Marseille. The left likes to spin the Muslim rioting and destruction as a purely economic and anti-racist reaction to French injustice. 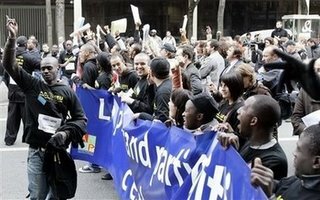 Certainly, the lack of job opportunities in France is very real. The irony of this accusation comming from the left is, that the lack of opportunities is largely due to France's rigid socialism and inflexible labor unions. 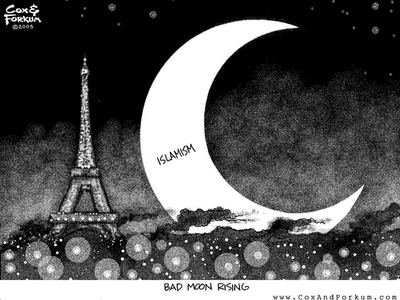 To dismiss the Muslim element entirely would be foolish, though it's hard to say where one begins and the other ends. Even if this were mostly about job opportunities, it could easily escalate into something more, and perhaps it already has. France has been insisting that Turkey recognise their role in the 1915 Armenian Genocide, before they are allowed to joiin the EU. This has made Turks and other Muslims very angry. Within two days of passing legislation in France making it a crime to deny the Armenian Genocide, a memorial shrine to the Armenian Genocide in Paris was destroyed. 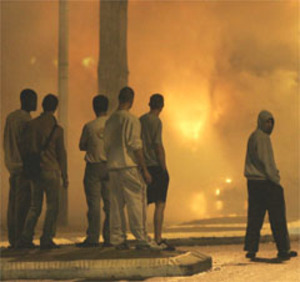 The escalation of rioting may be a part of this. 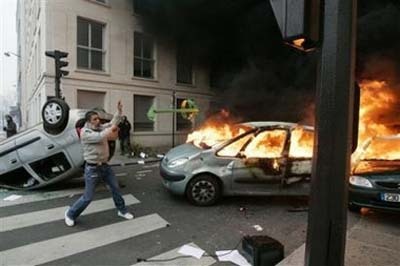 The rioting is also extending to Brussels, where fireman are being ambushed. November 1st will be a date to watch. Last year I read somewhere that 15% of the French army consists of Muslim soldiers and that this is the reason why the French authorities do not have the army restore law and order in the Muslim suburbs. So far, I have not been able to find confirmation of this figure in official statistics. In September 2005, the Institut français des relations internationales (French Institute for International Relations, IFRI) published a report stating that 10 to 20% of the army is of immigrant origin, most of them North African. “Their loyalty is continuously questioned,” Christophe Bertossi of IFRI said. Other countries (the Netherlands, Austria,...) also worry about radical Muslims in the military. 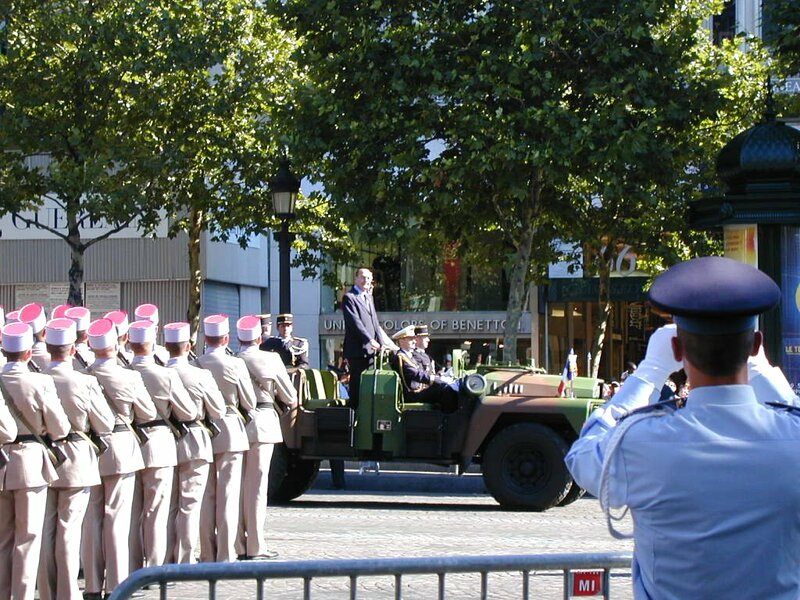 The photo is of Chirac inspecting the troops, on Bastille Day. Isn't that pink an interesting choice of hat color for a military uniform? I hope their riot police look a bit more formidable. The fatwa, dated June 6, 2006, was issued by the "fatwa department" of the Muslim American Society, Minnesota chapter, and signed by society officials. What is the Muslim American Society? In September 2004 the Chicago Tribune published an investigative article. The society was incorporated in 1993, the paper reported, and is the name under which the U.S. branch of the Muslim Brotherhood operates. The Muslim Brotherhood was founded in Egypt in 1928 by Hassan al-Banna. The Tribune described the Brotherhood as "the world's most influential Islamic fundamentalist group. "Because of its hard-line beliefs, the U.S. Brotherhood has been an increasingly divisive force within Islam in America, fueling the often bitter struggle between moderate and conservative Muslims," the paper reported. 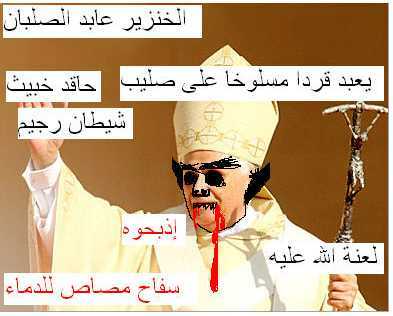 The international Muslim Brotherhood "preaches that religion and politics cannot be separated and that governments eventually should be Islamic," according to the Tribune. U.S. members emphasize that they follow American laws, but want people here to convert to Islam so that one day a majority will support a society governed by Islamic law. (bold emphasis mine) They can take their fatwa and shove it. Sideways. And whose brilliant idea was it to allow them mediate in a dispute where they clearly had a biased interest in the outcome? Has multiculturalism and political correctness cowed us to the point where we are afraid to even question such obvious manipulation? 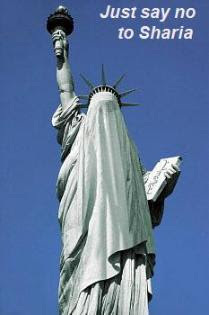 I'm completely against ANY attempts to introduce Sharia law, in any form, here in the USA. It's completely incompatible with a free democratic society, and those who want it need to go back to the countries they came from. The Cox & Forkum site has more links on this topic. More details, with historical photos. This photo is from a Muslim website. Does Multiculturalism encourage this kind of thing? It often sides with it, against Christianity. Why? Could it be that Multiculturalism is really just anti-Christian/Judaism masquerading as "tolerance"? 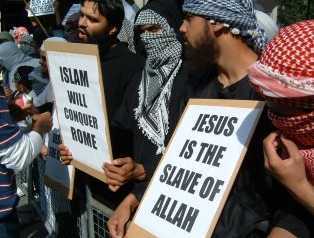 As a non-religious person, but still one that acknowledges and respects the impact of Judeo-Christian thinking on Western culture, I havewarned against naïve Christian compassion related to Muslim immigration, as well as a disturbing tendency among too many Christian organizations to ally themselves with Muslims, for "religious values" and against Israel. But frankly, the most useful allies Muslims have in the West more often than not tend to be found among the non-religious crowd. A number of executives and star presenters at the British Broadcasting Corporation admitted what critics already knew: The BBC is dominated by Left-leaning liberals who are anti-American and biased against Christianity, but sensitive to the feelings of Muslims. Former BBC business editor Jeff Randall said he complained to a very senior news executive about the BBC's pro-Multicultural stance, but was given the reply: "The BBC is not neutral in Multiculturalism: it believes in it and it promotes it." [...] In a newspaper essay co-authored by Eriksen, he states that: "Is he [Anfindsen] asking us to once again repeat the obvious in that the murder of Theo van Gogh, various acts of terrorism and death threats against newspaper editors have nothing to do with Islam?" Mohammed Bouyeri, born in Amsterdam of Moroccan parents, killed Theo van Gogh as he was cycling in Amsterdam on Nov. 2, 2004, shooting and stabbing before slashing his throat and pinning a note to his body with a knife. "I did what I did purely out my beliefs," he told judges while clutching a Koran. "I want you to know that I acted out of conviction and not that I took his life because he was Dutch or because I was Moroccan," but because he believed van Gogh insulted Islam in his film criticizing the treatment of Muslim women. So a peaceful Christian is accused of having a dark, secret agenda, while a Muslim murderer who brags openly about his Islamic motivations has nothing to do with Islam? Needless to say, Mr. Hylland Eriksen is also rather anti-Israeli. Christians and Jews are bad, Muslims are "misunderstood." This confirms my thesis that Political Correctness is a hate ideology disguised as "tolerance." 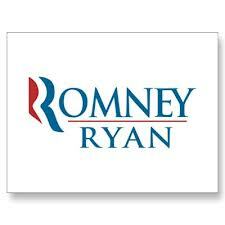 It is based upon hate against anything considered Western and a desire to eradicate this. Precisely indeed! When terrorists and murderers themselves proclaim their Islamic beliefs as their motive, and it's then refuted by multiculturalists, something is seriously wrong... with the multicuturalists. [...] Dalrymple also believes that "Discipline without freedom leads to misery, but freedom without discipline leads to chaos, shallowness, and misery of another kind," alluding to the total lack of freedom in Islam, but also to the seeming lack of direction in the West. This also helps explain the strong alliance between Western leftists and Fundamentalist Muslims. Both hate Western religion and values, but for different reasons and motives. I don't call myself a Christian, but I do recognise Christianity and Judaism as the cornerstones of Western civilization, and value the culture that has arisen from them. I like living in a Christian culture, and know it is worth defending. Multiculturalism believes and does exactly the opposite. Law and Order waning in Europe? The New Tools of "Stealth" Socialism? Got the link to this from Nealz Nuze today. I fell for a version of this trick once, it IS scary because you are concentrating on some stupid game when "it" happens, and it's so unexpected. This video is of some of the most dramatic reactions posted on YouTube. I felt sorry for the little boy, he was too young to do that trick on. But the adults were all fair game. But not for people with weak hearts! It's a funny video clip of a commercial for a French Pay Television channel. 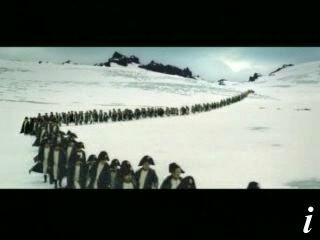 It involves the movie "March of the Penguins" (which in France, has the title "March of the Emperor"). Like much of French humor, it involves a misunderstanding. There are some other funny ads too, like the ones for "Bento Kronen" and "Bunker Shoes". Have a look around. Hat tip to Neal Boortz for the link, I discovered the site via his link to the "Bento Kronen" commercial. I think the French have quite a reputation of being "difficult", and not just with us. I think they tend to be difficult with everyone, even each other. And trying to pin them down on an issue can be seemingly impossible at times. [...] What follows is a brief outline of the thesis put forward by writer Bat Ye’or in her book “Eurabia: The Euro-Arab Axis.” My information is based on her book (which should be read in full). In addition I have drawn from some of her articles and interviews. I republish the information with her blessing, but this summary is completely my own. In an interview with Israeli newspaper Haaretz, Bat Ye’or explained how French President Charles de Gaulle, disappointed by the loss of the French colonies in Africa and the Middle East as well as with France’s waning influence in the international arena, decided in the 1960’s to create a strategic alliance with the Arab and Muslim world to compete with the dominance of the United States and the Soviet Union. 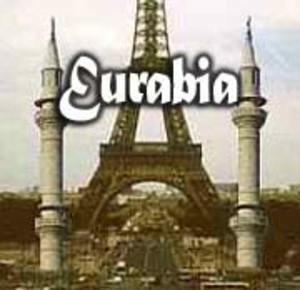 Thus, the Eurabian project became an enlarged vision of the anti-American Gaullist policy dependent upon the formation of a Euro-Arab entity hostile to American influence. It facilitated European ambitions to maintain important spheres of influence in the former European colonies, while opening huge markets for European products in the Arab world, especially in oil-producing countries, in order to secure supplies of petroleum and natural gas to Europe. In addition, it would make the Mediterranean a Euro-Arab inland sea by favoring Muslim immigration and promoting Multiculturalism with a strong Islamic presence in Europe. (bold emphasis mine) Fjordman maintains that while the European press talks endlessly about 9-11 conspiracies that claim WE blew up the WTC ourselves, they have nothing to say about the conspiracy of Eurabia, which is easily documemnted and factual. France as the leader of this movement, has a facinating history with the Arab world, going back to Napoleon, some of which is examined here also. This article is long and detailed, and the first installment of a series of articles. It goes a long way in explaining how Europe has gotten to where it is today, their complex relationship with the Middle East, and it's ensuing anti-Americanism, and the pivotal role of France in all of this. Why Is France Soft on Iran? The recent divergence in US and French policies with regard to Iran should come as little surprise, given French President Jacques Chirac’s policy that France’s “relations with the United States will never be submissive.” Yet The Independent has posited that France ’s change of mind may in fact be connected with the presence of French peacekeepers in Lebanon – that is to say within range of Iran’s military proxy, Hezbollah. There may be some truth to that assertion, but it is perhaps more instructive to look at France’s Iran policy over the last few decades, the better to round out the context. 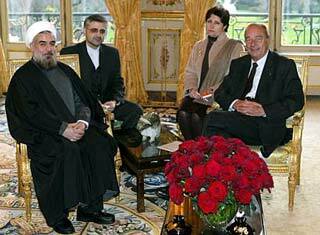 (bold emphasis mine) This is a short article, but it does explain a lot about France's uneasy relationship with Iran. [...] An examining magistrate ordered the members of the Iranian People's Mujahedeen (MKO) movement to be investigated for "conspiring with a terrorist organisation", judicial officials said. They were among 17 detained Iranian opposition supporters - including MKO leader Maryam Rajavi - who appeared before anti-terrorist judges in Paris. About 200 people from the MKO were arrested in a crackdown by French police over recent days. 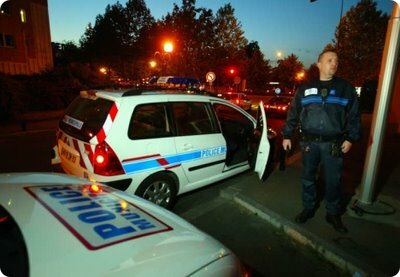 The 17 held in detention were being questioned over alleged plans to attack Iranian embassies across Europe. 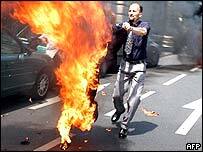 This photo of an Iranian woman who set herself on fire is just so horrible. When you think of "the streets of Paris", this is hardly the image that first comes to mind. I guess this is a reminder that France ain't what it used to be? 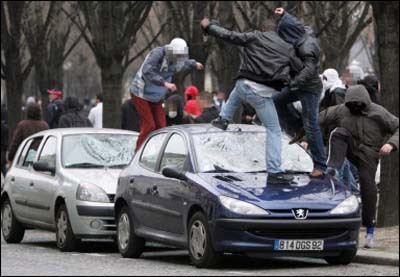 With all the car-b-ques, the French auto industry must be experiencing brisk sales. I'll bet auto insurance has gone way up. 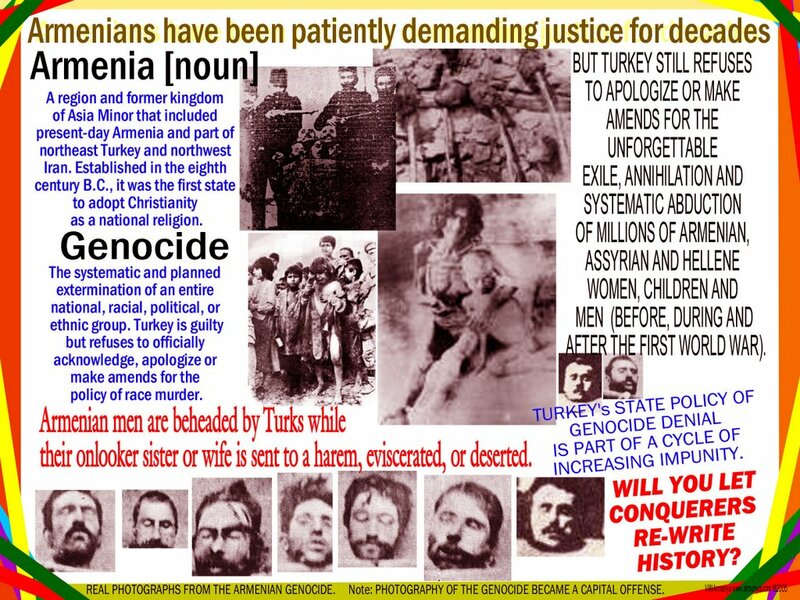 Turkey has legal restrictions forbidding anyone to claim there was an Armenian Holocaust. France has just passed a bill that does the opposite, forbidding people to claim that the Armenian Holocaust didn't happen. Now France is pushing to force Turkey to own up to the Armenian Genoicde, if they want to join the EU. What would Reagan do, faced with global Jihad? 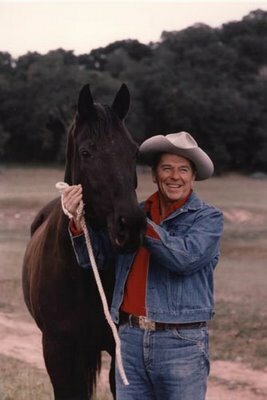 [...] Reagan’s genius was to recall the American people, and to a lesser extent the West, to the need to proceed from the premises of our Founders: life, liberty, and the pursuit of happiness as the inalienable rights of man, and government as existing merely to secure their just exercise. One did not win arguments with Communism when accepting Communist starting-points for those arguments. They led inevitably to the Communist end, and appeals to humanity were steamrolled by appeals to inexorable logic. I agree. When you start off with a faulty premis like that, everything that comes from it will fail, because it is not based on truth, on REALITY. Reagan understood that you must not challenge an opponent on false terms. To argue with lies as if they are real is pointless. You have to start with the truth, or you are lost. How often are we told that we need to be more understanding, and to reach out to "moderate" Muslims? But how moderate is ANYONE who advocates Jihad? And shouldn't genuinely moderate Muslims be reaching out to US? I think some of the genuinely moderate Muslims do, but they are largely ignored by the MSM, in favor of terrorist supporters like CAIR, who pose as moderates and lobby with foreign money to advance their hidden agenda. [...] Like Milton’s Satan who would rather rule in hell than serve in heaven, the average Muslim whom we face abroad much prefers some manner of shari’a (to which Williams refers as a dissuading factor) to the humiliation of life on the terms of the irreligious, secular West. We cannot hold this against them: they have the integrity of their faith, and it is their choice. But it does not follow from this that we must credit them with moral equality to ourselves — assuming we have a moral standing worthy of the name — and it does not follow from this that because they have integrity, that they are good. The answer for us infidels is not respect — beyond that due the individual with his inalienable rights — but frankness even at the cost of disrespect, and exclusion of the foe’s ideas and ideologues from our public square till a general sanity among them prevails. 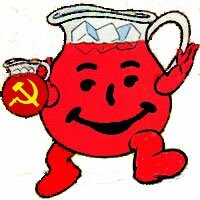 The ill-kept secret of Communism to which the elites adhered was that it was in its origins a squalid, murderous creed. Its founder was a moral leper, and its heroes were savages are surely as any pre-modern tribesman. It took a brave survivor of the Soviet Union’s concentration camp system, Alexander Solzhenitsyn, to state this truth plainly and irrefutably — and it took Ronald Reagan to make it policy, and enact it as the will of the American people. That is the lesson of Reagan’s war for ours. In a contest of ideas, truth and victory are inseparable companions. We only delay the latter in eschewing the former. We may call it politeness, or respect, or strategy: but it looks like defeat. (bold emphasis mine) Indeed! The entire article is worth reading, it's not long, and well worth your time. 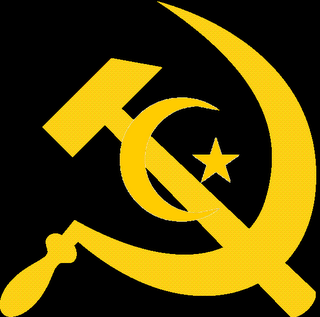 Further evidence that Communism and Islamism, while not exactly identical ideologies, still share enough similarities that would make Reagan's approach to dealing with Communism equally effective against Islamism. [...] Islamists see the Islamic state much the same way as Communists see the Communist Utopia - a Shangri-la world where their idea of justice prevail. The article goes on to compare the many ways in which these two thought systems are similar, even though one believes in God, and the other does not. In fact, the Communists disbelief in God is perhaps their biggest weakness in dealing with Islam. Communists believe that when their utopia is established, any belief in God will just fade away. 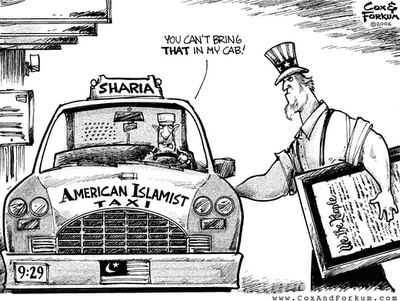 It is their "blind spot" when dealing with Islam. The article concludes that Iran is the perfect example of what happens to Communists who ally themselves with Islamic fundamentalists; they're slaughtered. This is an earlier post of mine, which compares Reagan's "Star Wars" strategy for precipitating the collapse of the Soviet Union and the end of the Cold War, with our situation with Islamism today. Islamism is in many ways on shakey ground, and if we stand up to it and challenge it, unrelentingly, instead of appeasing and encouraging it, we could end up with a similar result to what Reagan achieved with his "Star Wars" strategy and attitude. [...] When we talk of democracy, we don't mean just one man one vote. It also must include freedom of speech and freedom to choose one's religion. 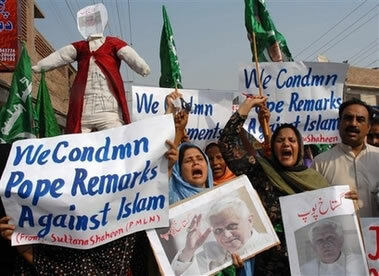 But according to shariah law, it is death for blasphemy and apostasy. Thus once again, Islam is in conflict with the basic tenets of democracy. That is why Bush's project to transplant democracy to the Middle East is so difficult if not impossible. So far, we have only looked at how Islam works in theory. How does it work in practice? Lets take a look at the empirical evidence. Of the 55 Muslim majority countries (not counting the Palestinian territory), only 5 are rated as Free by Freedom House. The rest are rated as Partly Free (24 countries) and Not Free (26 countries). That is a poor record. Islam has obviously produced a culture in which it is hard for democracy to take root. Yet western countries are admitting Muslim immigrants whose religious beliefs are not compatible with democracy and whose actual track record in adhering to the basic tenets of democracy is poor. Obviously, the more Muslims there are in a population that gives each person one vote, the more the country will be like what we have in an average Muslim majority country. Western democracy is at the moment still viable but the Muslim minority is growing fast with its higher birth rate. Already, one quarter of French children are Muslim. By the end of this century, Europeans might be majority Muslim and speaking Arabic. Unless Muslims acquire new values and abandon old ones, democracy will not be viable at some point. But so far, Muslims are not assimilating or acquiring new values that make a liberal democracy possible. A survey taken in Britain for example shows that 40% of Muslims there want Shariah Law. (3) Another survey showed that only one quarter of British Muslims regard Britain as their country. As expected their primary loyalty is to the Muslim Ummah. I predict that as the Muslim minority grows, social tensions will also grow. Ascerbating the tensions will be the economic disparity between Muslims and non-Muslims. This can be seen in a survey done by Essex University. (5) The survey states that Pakistanis and Bangla Deshis (who are mostly Muslims) are easily the poorest people in the UK with high levels of unemployment and large families. It should be noted that Indians and Chinese have earnings on par with whites. Thus the under-achievement of Muslims in the UK cannot be due to racial discrimination. After all, the successful Indians (who are mostly Hindus) are racially very similar to Pakistanis and Bangla Deshis. As I argued in my earlier articles, such as 'How Islam failed Muslims', Islam has impeded the progress of Muslims (8). I argued that Islam is a warrior's religion designed to facilitate Arab imperialism. While it can still produce brave warriors, it cannot produce the sort of people needed for a modern society. There is more to the article, it's a very honest and IMO non-judgmental look at the situation using observable facts. It ends with a great quote from Winston Churchill, who warned that no stronger retrograde force existed in the world than Islam. What is to be done about it? For starters, we can stop the multicutlural nonsense that demeans our own culture while exalting and encouraging their "sharia law" totalitarianism at the expense of our democracy. We can stop exibiting a "dhimmi" attitude which only encourages them to be more demaning and violent. And perhaps most importantly, we need to recognize the alliance between the western socialist left and the Islamic extremists. Both have totalitarian goals, and while they may aim for different ends, they seek the same path to power. I see radical Muslims as a symptom of our own weakness; they have been the same for centuries. The only reason they are so bold today, is the same one that made them bold in centuries past: it's because they see us as weak. Socialism and it's useful tools of Multiculturalism and political correctness have helped greatly to bring this about, and make it possible to continue and worsen. Extending liberal tolerance to the completely intolerant is suicide. Europe is ahead of us on this path, and we would do well to learn from their mistakes. Socialism has plenty of dangers inherent to it in it's own right. But what if it were infiltrated and used by a third party, one with no interest in using Socialism as a stepping stone to Communism, but as a stepping stone to an Islamic Sharia-law state? Recent election results in European countries indicate this may be happening on a larger scale than anyone imagined, as Socialist parties there make large gains by running Muslim candidates to gain Islamic votes. I have warned earlier, especially (in the essay Electing a New People: The Leftist-Islamic Alliance), against Islamic infiltration of Leftist parties in the West, most recently demonstrated in Belgium, and the threat this poses to Western democracy. This is part of the reason why I advocate containment of the Islamic world and an end to Muslim immigration. Pundit Ohmyrus makes some of the same observations. But there is also another way in which Muslim immigration threatens our Western society. “Jihad has demonstrated an astonishing adaptability to different historical and material conditions. Yet the secret of the success of the Arab bands lay less in their own warlike qualities than in the weakness and decadence of the empires they overthrew. […] The jihadists are not interested in winning in our sense of the word. They can succeed simply by making the present world order unworkable, by creating conditions in which politics-as-usual is no longer an option, forcing upon the West the option either of giving in to their demands or descending into anarchy and chaos. (bold emphasis mine) Recent elections in Europe where Muslims have infiltrated the left, give them the tools to achieve these ends. Muslims can thus undermine Western democracy in two ways: By massive immigration and infiltration of established, especially Socialist, parties until they can be turned to serve the Islamic agenda, or by simply creating a climate of fear and distrust that gradually makes the democratic system unworkable. In Western Europe right now, they are making significant headway on both accounts. Socialism and Islamic Sharia law both have no need for individual freedom or real democracy. They can cooperate in that goal, but ultimately they would diverge, and the stronger one would consume the other. And I would say that Socialism is not the stronger of the two. Ramadan violence, attacks on French police officers, escalating attacks on Jews... sounds like "making the Democratic system unworkable" to me. And the Socialists, working with the Muslims, are doing their part to make it all possible. A detailed look at Islams miserable track record with democracy, and it's persistant clashes with democratic societies. Socialists, Multiculturalists and "trust levels"
Socialists who are willing to do ANYTHING to win elections; Multiculturalists who do not understand the nature of Islam; and very different cultural worldviews in European and Middle Eastern cultures regarding issues of trust, are all helping in different ways to make the Western democratic system unworkable... so it can be replaced with something else. Europe's Socialist parties have increasingly been making large gains in elections with the help of Musilm immigrants. But there is concern, even among Socialists, that Muslims are simply infiltrating Europe's Socialist parties, until they can be turned to serve the Islamic agenda. Could this be true? Looks like the socialists will do anything to grab power. But what will happen when it's time to pay the piper, even if they don't like the sharia tune? 2006 will go down in European history as the year when Muslims as a group became a dominant factor in elections. The demographics indicated this long ago, but it still came as a surprise to many multiculturalists that Muslims tend to vote primarily along ethnic lines: Muslims vote for Muslim candidates, even if the political parties give the latter almost unelectable places on the list of candidates. As a consequence the Muslim candidates got elected to the detriment of indigenous politicians. Party leaders, who used to be able to get those candidates elected which the leadership favoured, have been taken by surprise by Turks voting only for Turks and Moroccans voting exclusively for Moroccans. The parties that put Muslim candidates forward are being “cannibalized” from the inside. They risk being taken over by radical Muslims. This is what is happening to the Socialist parties in Belgium and the Netherlands. The article proceeds to take an in depth look at trust levels, how they are formed and how they work, in European culture, and in the Middle East. There are some striking differences. Europeans tend not to trust clans or family, as much as they do the Nation-State, their fellow citizens and the rule of law. While in the Muslim world, there is not complete agreement about interpretation of the Koran and the practice of Islam, there are core beliefs that transend the differences in sects. It's not hard to understand how competing sects could still cooperate against infidel outsiders who are not a part of the Umma. It's not hard to understand why members of the Umma would embrace an opposition party they disagree with in a host country, to simply use it for their own purposes. Can it happen in the USA? Will Dems Embrace Candidate Backed by CAIR? 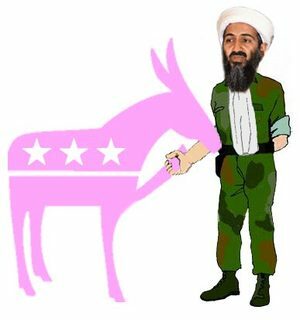 [...] Democratic credentials on national security could be undermined if they fail to denounce a candidate closely allied with someone that a senior Democrat described as having "intimate connections to Hamas." Known for months has been that Ellison was involved in the 1990's with the Nation of Islam, which even he now concedes is racist and anti-Semitic. In a letter of apology to the local Jewish community, Ellison claimed that he was never a member of the NOI and thus didn't realize until later the organization's ugly ideology. But according to press accounts at the time, Ellison served as NOI spokesman at a 1997 public hearing where he defended--in his own words--"the truth" of a government official's supposed comment that "Jews are the most racist white people.". Only learned recently and far more troubling is Ellison's seemingly tight connection with Nihad Awad, co-founder of the Council on American-Islamic Relations (CAIR), whom he met almost two decades ago at the University of Minnesota. Ellison's campaign obviously has downplayed the affiliation with Awad. But here are the facts: Awad headlined a fundraiser last month that the campaign estimates netted $15,000 to $20,000, and in July, and it appears that CAIR's co-founder bundled contributions totaling just over $10,000. (The campaign issued a terse denial on the latter point, though it refused to explain away overwhelming evidence to the contrary.) The campaign has gone so far as to suggest that Awad did all this without having any contact with someone he's known since the late 1980's. Just as in Europe, if you question what a Muslim does, the left calls you a racist, which is supposed to stun you into silent submission. I say, lets not do that. Lets not be cowed by leftists using the race card. Lets learn something from Europe's mistakes. Questions need to be asked. Ellison's campaign, and the Democrats, needs to be watched closely. Terrorist front group CAIR is at work again. When you can't deny the message, attack the messenger. This reminds me of what our own socialists here in the USA - the Democratic Party - are trying to do; change our laws to give the vote to anyone who has lived within our borders for even a short period of time. Ironically, as I pointed out earlier, in their efforts to counter the indigenous “racists” and “fascists” of the VB, the Socialists and Christian-Democrats do not hesitate to put far-right Muslim candidates on their electoral lists. Some of them, such a Murat Denizli, a member of the Turkish racist and fascist organization Grey Wolves which assassinates Socialist councilors at home, have now become Socialist councilors in Belgium (Mr Denizli was elected for the Parti Socialiste in the Brussels borough of Schaarbeek). It's precisely that sort of thing that most unnerves me about the left, their willingness to embrace as allies the very people who would kill them. I call it their "tendency to suicide". 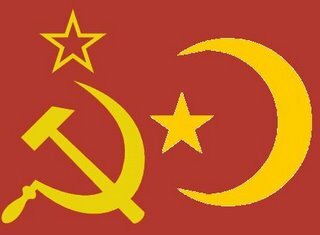 Once the left succeeds in destroying their political opposition, they will find that their Muslims allies have no interest in socialism, or any reason to further support socialists. One of the new Muslim Socialists who is Turkish, wants to demolish the Brussels monument for the genocide of the Armenians. According to him the genocide never happened. The rewritting of history has already begun. It's been said that it's the victors of war who write our history. Are we witnessing a war, an invasion of Europe, that will be won by Muslims without having to even fight? We have seen videos on TV of Muslim Jihadis beheading infidel hostages. Less attention has been paid to the fact that Muslims are beheading entire nation states. Although this is happening in slow motion, it is no less dramatic. Historically, the major cities have constituted a country’s “head,” the seat of most of its political institutions and the largest concentration of its cultural brainpower. What happens when this “head” is cut off from the rest of the body? In many countries across Western Europe, Muslim immigrants tend to settle in major cities, with the native population retreating to minor cities or into the countryside. Previously, Europeans or non-Europeans could travel between countries and visit new cities, each with its own, distinctive character and peculiarities. Soon, you will travel from London to Paris, Amsterdam or Stockholm and find that you have left one city dominated by burkas and sharia to find… yet another city dominated by burkas and sharia. 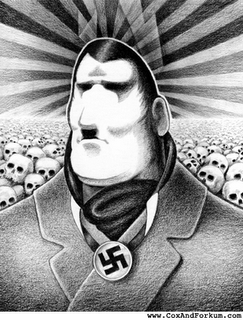 This cartoon is titled "The Ahmadinejad Code", and was an element in a stealth entry in the Holocaust International Cartoon Contest sponsored by Iran. You can Continue reading "The Ahmadinejad Code". It has more information and pics about the contest. Another warning: there are lots of anti-jewish cartoons from the contest. Can anyone doubt Hitler would have approved? 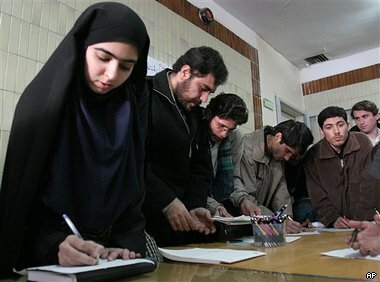 The purpose of the Iranian contest was supposed to be a kind of retaliation for the Muhammed Cartoons published in a Danish newspaper, which supposedly caused riots world wide (but they didn't really cause the riots - read the full story Here). Iran's Holocaust cartoon contest is offensive to many people, but notice there are no Jews, Christians or ANYONE rioting and killing and burning down embassies over the cartoons. That irony seems lost on the contest's sponsors in Tehran. ... 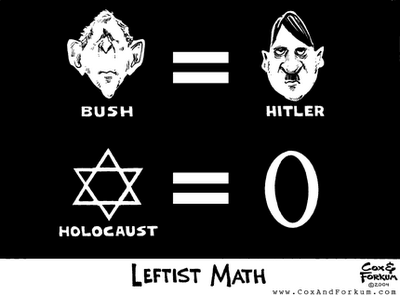 In political discussions, Nazi comparisons are grossly misused, particularly by the "anti-war" left which has made an industry of comparing President Bush to Hitler. Such a comparison renders the Holocaust meaningless, for whatever Bush's faults, he is no more the next genocidal mass murderer of Jews than Cindy Sheehan is the next Secretary of Defense. During the Hezbollah/Israel war, leftists, Islamists, and even Ahmadinejad himself accused Israel of being Nazi-like. Such atrocious moral equivalence requires a massive evasion of reality, including the fact that it is Iran's Hezbollah terrorists who goose step and salute like Nazis while openly fighting to destroy the Jewish state. Yet the answer is not to dogmatically eschew Nazi analogies because of their misuse, for that would only serve to undermine any lessons we should have learned from history. For the reasons stated above, I chose to apply the Hitler comparison to someone who is truly earning it. This is a story you don't hear much about. It's ironic, that Arab holocaust heros can't be celebrated by people who refuse to acknowlege the holocaust even happened. Remember when Ronald Reagan challenged the Soviet Union with his "Star Wars" missle defense system? It turned out to be a smart move, which pushed a weakened Soviet Union to it's collapse and ended the Cold War. Is it possible that Jihadist Islam is also weaker than it seems? If it were stood up to vigorously and consistantly, might it also crumble? Here are two articles that address the first of those two questions. What the West can learn from the Muslim youths who throng my city’s prisons. In this article for City Journal magazine, Dalrymple makes a case for the idea that Islam, in it's clash with modernity, might be acting up violently now precisely because it knows the end is near, and we are witnessing it's death throws. At first I found this idea difficult to consider, but then I read about Dalrymple's experiences, and considered his reasoning. I'm not sure I'm completely convinced, yet this theory does explain a lot. Dalrymple's career as a psychiatrist working in British Hospitals and prisons has given him a front row seat in witnessing Islams clash with modernity, and it's often tragic and painful consequences. [...] Every Muslim girl in my city has heard of the killing of such as she back in Pakistan, on refusal to marry her first cousin, betrothed to her by her father, all unknown to her, in the earliest years of her childhood. The girl is killed because she has impugned family honor by breaking her father’s word, and any halfhearted official inquiry into the death by the Pakistani authorities is easily and cheaply bought off. And even if she is not killed, she is expelled from the household—O sweet my mother, cast me not away!—and regarded by her “community” as virtually a prostitute, fair game for any man who wants her. This pattern of betrothal causes suffering as intense as any I know of. It has terrible consequences. One father prevented his daughter, highly intelligent and ambitious to be a journalist, from attending school, precisely to ensure her lack of Westernization and economic independence. He then took her, aged 16, to Pakistan for the traditional forced marriage (silence, or a lack of open objection, amounts to consent in these circumstances, according to Islamic law) to a first cousin whom she disliked from the first and who forced his attentions on her. Granted a visa to come to Britain, as if the marriage were a bona fide one—the British authorities having turned a cowardly blind eye to the real nature of such marriages in order to avoid the charge of racial discrimination—he was violent toward her. She had two children in quick succession, both of whom were so severely handicapped that they would be bedridden for the rest of their short lives and would require nursing 24 hours a day. (For fear of giving offense, the press almost never alludes to the extremely high rate of genetic illnesses among the offspring of consanguineous marriages.) Her husband, deciding that the blame for the illnesses was entirely hers, and not wishing to devote himself to looking after such useless creatures, left her, divorcing her after Islamic custom. Her family ostracized her, having concluded that a woman whose husband had left her must have been to blame and was the next thing to a whore. She threw herself off a cliff, but was saved by a ledge. [...] The Muslim immigrants to these areas were not seeking a new way of life when they arrived; they expected to continue their old lives, but more prosperously. They neither anticipated, nor wanted, the inevitable cultural tensions of translocation, and they certainly never suspected that in the long run they could not maintain their culture and their religion intact. The older generation is only now realizing that even outward conformity to traditional codes of dress and behavior by the young is no longer a guarantee of inner acceptance (a perception that makes their vigilantism all the more pronounced and desperate). Recently I stood at the taxi stand outside my hospital, beside two young women in full black costume, with only a slit for the eyes. One said to the other, “Give us a light for a fag, love; I’m gasping.” Release the social pressure on the girls, and they would abandon their costume in an instant. Anyone who lives in a city like mine and interests himself in the fate of the world cannot help wondering whether, deeper than this immediate cultural desperation, there is anything intrinsic to Islam—beyond the devout Muslim’s instinctive understanding that secularization, once it starts, is like an unstoppable chain reaction—that renders it unable to adapt itself comfortably to the modern world. Is there an essential element that condemns the Dar al-Islam to permanent backwardness with regard to the Dar al-Harb, a backwardness that is felt as a deep humiliation, and is exemplified, though not proved, by the fact that the whole of the Arab world, minus its oil, matters less to the rest of the world economically than the Nokia telephone company of Finland? I think the answer is yes, and that the problem begins with Islam’s failure to make a distinction between church and state. Unlike Christianity, which had to spend its first centuries developing institutions clandestinely and so from the outset clearly had to separate church from state, Islam was from its inception both church and state, one and indivisible, with no possible distinction between temporal and religious authority. Muhammad’s power was seamlessly spiritual and secular (although the latter grew ultimately out of the former), and he bequeathed this model to his followers. Since he was, by Islamic definition, the last prophet of God upon earth, his was a political model whose perfection could not be challenged or questioned without the total abandonment of the pretensions of the entire religion. But his model left Islam with two intractable problems. One was political. Muhammad unfortunately bequeathed no institutional arrangements by which his successors in the role of omnicompetent ruler could be chosen (and, of course, a schism occurred immediately after the Prophet’s death, with some—today’s Sunnites—following his father-in-law, and some—today’s Shi’ites—his son-in-law). Compounding this difficulty, the legitimacy of temporal power could always be challenged by those who, citing Muhammad’s spiritual role, claimed greater religious purity or authority; the fanatic in Islam is always at a moral advantage vis-à-vis the moderate. Moreover, Islam—in which the mosque is a meetinghouse, not an institutional church—has no established, anointed ecclesiastical hierarchy to decide such claims authoritatively. With political power constantly liable to challenge from the pious, or the allegedly pious, tyranny becomes the only guarantor of stability, and assassination the only means of reform. Hence the Saudi time bomb: sooner or later, religious revolt will depose a dynasty founded upon its supposed piety but long since corrupted by the ways of the world. The second problem is intellectual. In the West, the Renaissance, the Reformation, and the Enlightenment, acting upon the space that had always existed, at least potentially, in Christianity between church and state, liberated individual men to think for themselves, and thus set in motion an unprecedented and still unstoppable material advancement. Islam, with no separate, secular sphere where inquiry could flourish free from the claims of religion, if only for technical purposes, was hopelessly left behind: as, several centuries later, it still is. The indivisibility of any aspect of life from any other in Islam is a source of strength, but also of fragility and weakness, for individuals as well as for polities. Where all conduct, all custom, has a religious sanction and justification, any change is a threat to the whole system of belief. Certainty that their way of life is the right one thus coexists with fear that the whole edifice—intellectual and political—will come tumbling down if it is tampered with in any way. Intransigence is a defense against doubt and makes living on terms of true equality with others who do not share the creed impossible. (bold emphasis mine) Dalrymple continues on with some very astute comparisons of Islam with Christianity, and the many ways the inflexibility of Islam forces it's adherents into a self-imposed ghetto of thought, which Christianity was able to avoid. [...] People grow angry when faced with an intractable dilemma; they lash out. Whenever I have described in print the cruelties my young Muslim patients endure, I receive angry replies: I am either denounced outright as a liar, or the writer acknowledges that such cruelties take place but are attributable to a local culture, in this case Punjabi, not to Islam, and that I am ignorant not to know it. But Punjabi Sikhs also arrange marriages: they do not, however, force consanguineous marriages of the kind that take place from Madras to Morocco. Moreover—and not, I believe, coincidentally—Sikh immigrants from the Punjab, of no higher original social status than their Muslim confrères from the same provinces, integrate far better into the local society once they have immigrated. Precisely because their religion is a more modest one, with fewer universalist pretensions, they find the duality of their new identity more easily navigable. On the 50th anniversary of Queen Elizabeth’s reign, for example, the Sikh temples were festooned with perfectly genuine protestations of congratulations and loyalty. No such protestations on the part of Muslims would be thinkable. (bold emphasis mine) Dalrymple goes on to talk about the young Muslim men he has dealt with in prison, and how difficult it is for Muslims to embrace secularism without completely abandoning their religion, and how tragic the consequences can be when they do. Too often, many see the choice as one of "all or nothing". Dalrymple has a great deal more to say, the article is rather long, and I have skipped over a lot of really interesting things. I recommend reading the whole thing. ... If a person is incapable of tolerating criticism, including mild criticism, and especially if he perceives criticism where there is none, this is often a sign of this person’s deep psychological insecurity. Rude aggression and wild rage, too, are usually not the normal behaviour of a self-confident person, but rather of someone who knows that he will lose an argument unless he can bully others into silence. 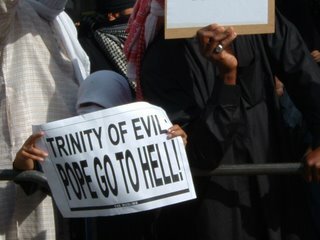 Last Sunday, Catholics going to Holy Mass in London’s Westminster Cathedral were confronted by Christophobic Muslims, carrying hate posters such as “Pope go to hell,” “Benedict watch your back,” “May Allah curse the Pope,” “Jesus is the slave of Allah, “Islam will conquer Rome,” and the like. An English blogger has some photos here. 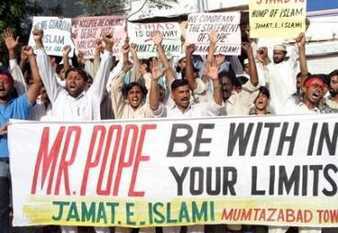 What must one make of these Muslim protestors? Do they look like self-assured people? I hope it has begun... at least, the decline of the Jihadist variety. I expect Islam in some form will always be around. We can only hope it's in a form that can accept criticism and deal with modernity. The Muslims themselves can do this, if only they would allow themselves to. If only the beheaders and Jihadists among them can be restrained or stopped. At the top of this post in the title, I mentioned a "Star Wars" stradegy for Islam. I remember when Presiden Reagan proposed his "Star Wars" defense plan; the liberals went crazy. They said it was too expensive, wouldn't work, and was a waste of money. They complained it was confrontational to the Soviet Union, and therby anti-peace; Reagan was a war-mongering monster. There were rumors that the Soviet Union was crumbling internally. I remember at the time, liberals vociferously denying this. One article I read by a liberal journalist, only weeks before the fall of the Berlin wall, claimed he had visited behind the iron curtain recently, and found that their economy was as strong an vibrant as ever, and that President Reagan was insane to challenge them. 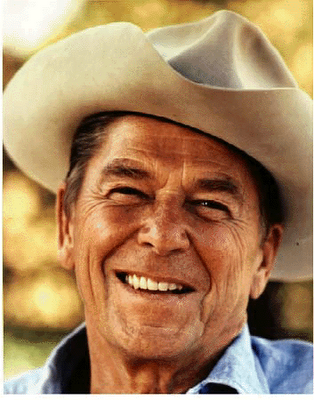 History proved Reagan to be right; challenging and standing up to the Soviet Union helped bring about their downfall. I can't help but wonder if we are facing a similar situation with radical Islam; if it has become so strident and desparate, because is has seen it's own destruction, like the above authors suggest. If that is so, then shouldn't we be standing up to it and challenging it? Imagine what would have happened if, when the Muhammed cartoon riots began, every newspaper in the western world published them? If they were shown on TV, and talked about? If western journalists actually did some journalism, did some digging and talked about the real causes of the cartoon riots? It would have been educational for everyone, and Muslims worldwide would have had a greater chance to learn how so many of them were duped by false information and lies. If the media had a backbone, the deception would have been exposed, and the lying imams who instigated the propaganda campaign would be forced to think twice before attempting it again. But instead, the Western Media caved in to unreasonable demands under the threat of violence, teaching the propagandists that lies and violence work, and help achieve the dhimmi attitude they want from the press, so that they can continue their agenda unquestioned, unobserved and unreported. We are facing a world-wide threat, that grows each time we let it continue unchallenged. Every time we back down, they declare a victory, push forward, and are encouraged to make even more unreasonable demands. 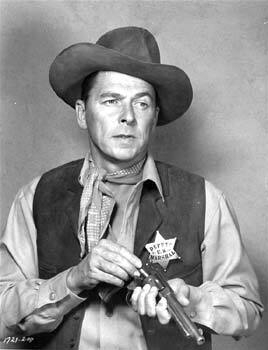 I say it's time we take a page from Reagan's book, and cultivate and promote a "Star Wars" attitude towards radical Islam.